The opening round of the Championship in Formula 6 is also the O Plate meeting. 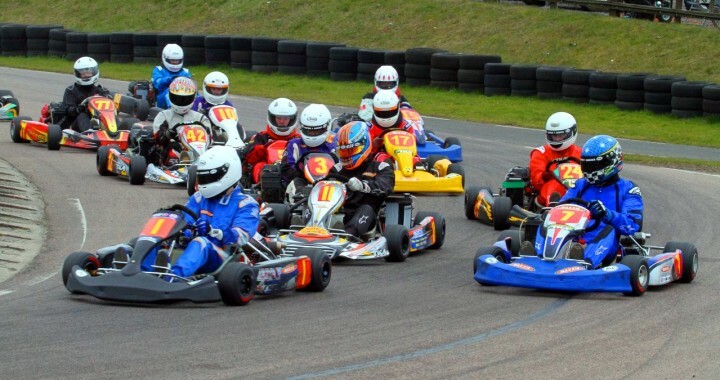 17 karts created a large grid for Senior TKM 4 Stroke, equalling that of the British Championships this year, and hopefully many of these will stay with F6 to help their ever increasing problem with lack of entries. The racing was mixed throughout the grid, with quite a large division of speed, however the top five had a list of names that was not going to create an easy meeting. I was able to take victory from pole in the first heat of the day, and managed to finish 5th in the second heat from the back of the grid, whilst also setting the fastest lap. My results from the heats had earned me pole position for the Final, and I managed to keep hold of the lead after the first few laps. I wasnt the fastest in the Final, but the lap times were still close, making it difficult for anyone to pass. I was allowed a slight gap midway through the race when there was a bit of battling going on behind me, and then with a bit of defending on the last lap I was able to take the race win and consequently the O Plate. Posted in Formula 6 Championship and tagged Bayford Meadows.